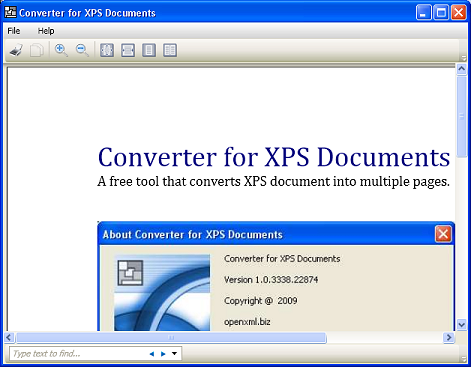 Converter for XPS Documents is a small but powerful tool that converts XPS (XML Paper Specification) documents into image files. It works by generating an image for every page of the XPS document. It lets you set the resolution of the images in DPI (dots per inch) and supports the formats PNG, JPEG, TIFF and BMP. Organizations will find this useful for working with the individual pages of the XPS file, whether for the purposes of archiving them in a database, perfoming further editing, using them in a presentation, or embedding the images in a html web page. The usage of the converter is trivial. 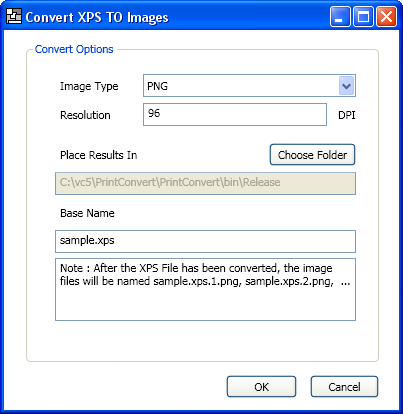 You just need to open an XPS file, and choose the File->Convert To command to display the dialog shown below. With this dialog, you can select the Image Type (PNG, JPEG, TIFF or BMP) and set the Resolution (image size). The Base Name determines how the images are named and the Place Results In field specifies the folder to place the generated files. For Windows Vista users, the runtime is already installed and you do not need to install the .Net Framework. Version 1.2 of the Writer is ready for download.